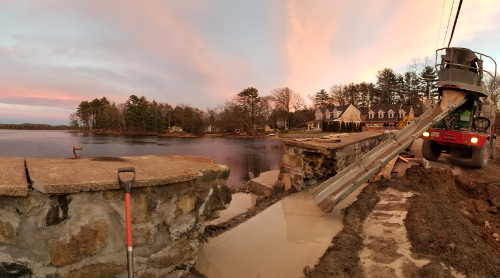 SA designed repairs to Reservoir Pond Dam to mitigate persistent uncontrolled seepage and pass the 500-year design flood, and completed permitting, bidding, and construction oversight. 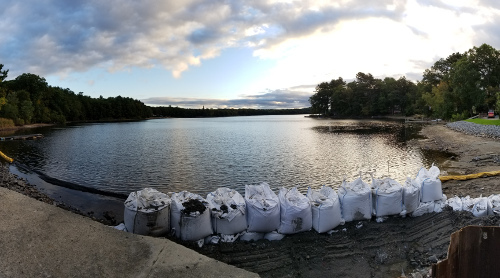 The Town of Canton recently obtained ownership of this Large Size, Significant Hazard dam after a private developer purchased former mill property inclusive of the dam. The crest carries Pleasant Street, a Town road, while the Dam was privately owned until the transfer. 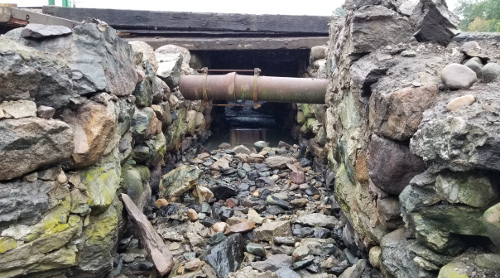 The Town engaged SA to review history and documentation of previous, unsuccessful repairs, and to design new repairs to mitigate persistent uncontrolled seepage, improve operations, reduce future maintenance costs, and improve dam safety. Following document review, SA conceptualized alternatives for repair and estimated costs for design, permitting and construction of the alternatives to assist the Town in budgeting. SA subsequently designed and prepared permit applications for a temporary cofferdam to reduce seepage risks to the Dam while maintaining Pond elevations near normal levels for wetland resource protection and public recreational use while repairs were designed, permitted and bid. The Dam and Pond are used for recreation and flood control, attenuating flooding to protect downstream areas, including the Town Center. SA evaluated hydrology and hydraulics using the most recent precipitation predictions, and found that the Dam as previously configured and operated was no longer capable of safely passing the spillway design flood. 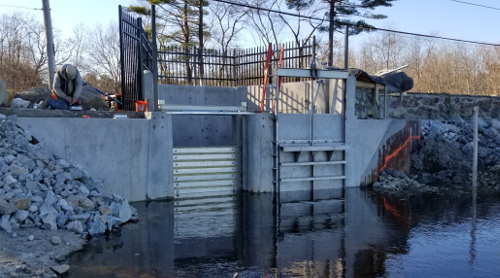 SA designed a new, gated primary spillway to pass the deign flood and optimized operations to maintain previous seasonal pool elevations for recreation, maintain adequate freeboard during floods, and pass floods without increasing discharge compared to existing conditions. SA also performed subsurface explorations, evaluated subsurface seepage by 2D-finite element modeling, and designed embankment drainage and soil filters to control seepage. 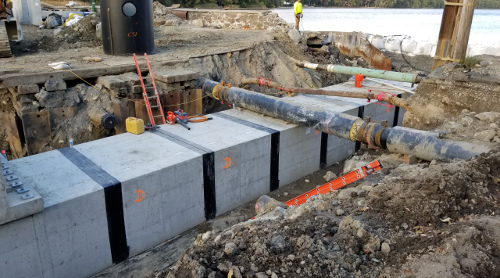 SA designed a new primary spillway consisting of a cast-in-place concrete inlet structure connected to an innovative pre-cast concrete segmental box raceway to replace the former stone masonry spillway and raceway. 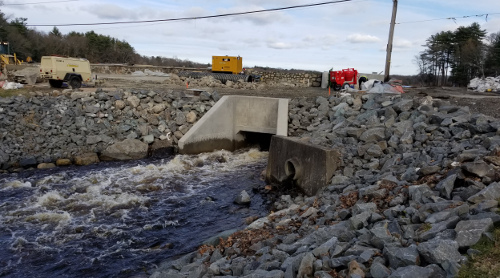 The new spillway mitigated uncontrolled seepage through the former stone masonry and sped construction by using precast concrete segments with gasketed joints, reducing duration of road closure. SA prepared an operation and maintenance manual and contract documents, applied for applicable permits, advertised and administered the construction bid, reviewed qualifications of low bidders, and consulted with the Town in selecting a contractor. 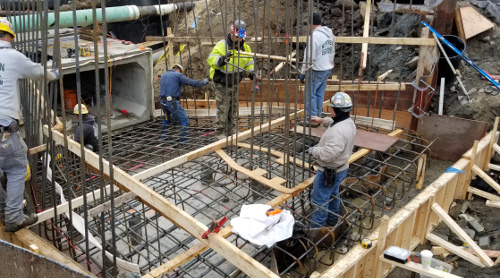 Construction included installation of the precast concrete raceway beneath active buried utilities, water diversion/pumping, sheetpile installation near sensitive existing structures, reinforced concrete structures, and road paving. 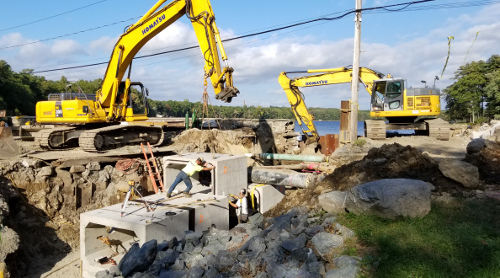 During construction, SA designed a rapid and cost-effective subsurface grouting program to fill voids in buried stone masonry walls uncovered by the demolition. 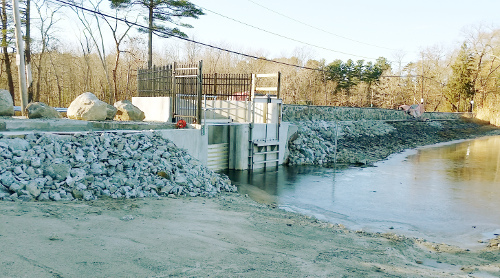 SA managed the Project during construction on Town’s behalf, observing construction for conformance with contract documents, performing concrete and soil materials testing, documenting construction and reporting to Massachusetts Department of Conservation and Recreation, Office of Dam Safety (MA DCR ODS) to meet MA DCR ODS dam regulations. SA administered the construction contract, reviewed contractor invoices, negotiated change orders, and managed contract close-out.